Cuba just won the award at the International Tourist Fair in Madrid as the safest tourist destination in the world! Includes all breakfasts, all lunches, some dinners, private charter bus, multi-lingual local tour guides, airport transfers, lodging and of course me being with you 24/7! Registration is on a first come first served basis. There are a limited number of rooms available. 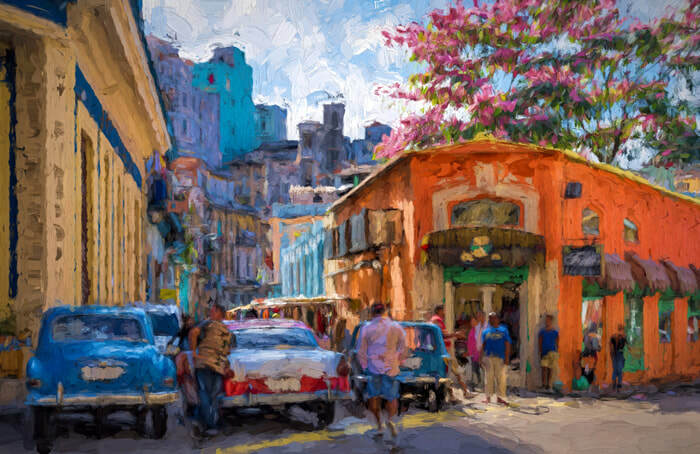 Since 2013 I have brought 250 artists and art lovers from America to Cuba (including 100 painters and non painting spouses in February of 2016) and the memories they've brought back will stay with them forever. I have worked exclusively with Cuba Explorer - the Travel Service Provider that brings thousands of Americans to Cuba each year. Some images of the Riviera Hotel in Havana. Great Throwback Hotel: As soon as you walk in the entrance, you realize this is not a modern hotel but one that harkens back to the Ratpack and Gangsters. It has recently been upgraded and is clean and well kept. Excellent ocean views and located along the Malecon sea wall. This is my own video tour of the Riviera taken 2 years ago. No need to spend a night at a hotel in Miami before taking a charter flight to Havana - we are now able to take commercial flights directly to Havana from several US airports. United, Delta, Jet Blue, Southwest, American, Alaska Airlines, Aeromexico all fly into Havana. Non-stop flights are available from Charlotte, Atlanta, Fort Lauderdale, Houston, Los Angeles, Miami, Tampa and of course JFK in NYC. I will help coordinate flights for you and will work with you every step of the way. 1) do not click on Sign In.. You'll do that later once you create a log in account. 2) Click on Costs, dates, book now. 3) That will take you to the bottom of that page where you click on Book Now. 4) Here is where you create your own login account: create an email and password. 5) Fill in your personal information. 6) Click on Add Fellow Travelers to my Registration only if you are planning to pay for your roommate. If not they will need to fill out the same form. Click 'continue'. 7) Review and Agree with the terms listed and you will see where you can enter your credit card information. If you register before February 5 you will receive a 5% discount applied when you send in your final payment. Any problems or questions just call me.